2014-12-30 update: Fixed a few issues with the diagrams. Back in my College Pro Painters manager days, I was a bit overwhelmed with everything I had to do. Max, my general manager (and the best boss I ever had), taught me a simple tool to help answer the fundamental question of what to do next. I don’t recall his name for it, but I call the tool Value Quadrants. 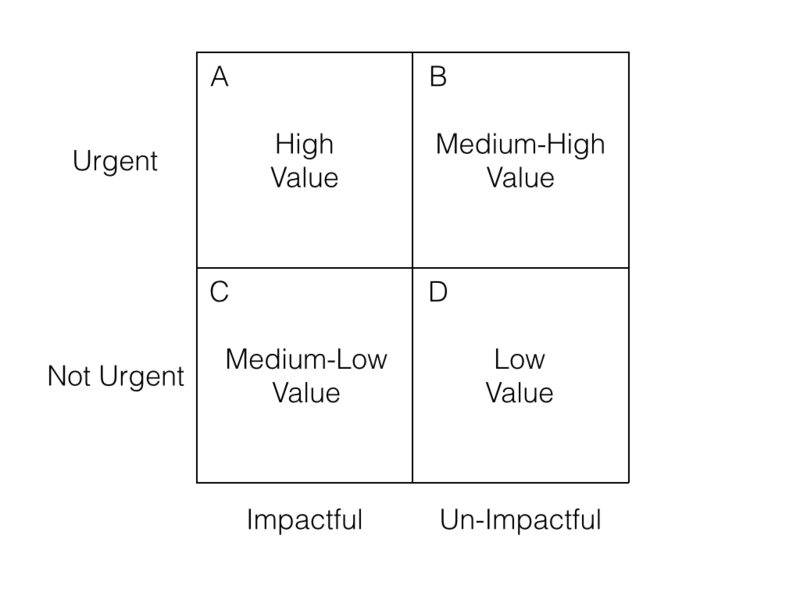 Since I learned it almost ten years ago, I’ve found Value Quadrants useful in every job I’ve had. I’ve mentioned it casually to a few of my teammates at Rocket Lift, and they were interested to learn more. So, here’s a write I hope you’ll find useful, as well. Too much to do! What to prioritize? To set the scene: Any given day running paint crews, I had to check in with clients on our progress with their houses, fine tune our schedule for upcoming projects, pick up supplies from a handful of stores, check in with my three crews, respond to email, knock on doors, schedule calls with leads, go to sales meetings, finalize estimates, total up job costs, deposit checks, process payroll, fuel up the truck, and so on. Those were just my routine tasks, not including any fires that needed putting out. There were so many things I had to do at any given moment, and everything seemed urgent. When you’re trying to provide great customer service, anticipate problems to nip them in the bud, and go above and beyond, there’s no end to the todo list you can come up with. So I was never “done”. It was tough to identify the right things to do first, and have peace of mind knowing that anything I wasn’t working on could wait. The basic principle Max taught me is that importance isn’t a very helpful way to order tasks. Tasks are “important” for different reasons. Some are time sensitive, some make a big difference, and some are both. So, trying to sort “important” things into a priority order is really tough. 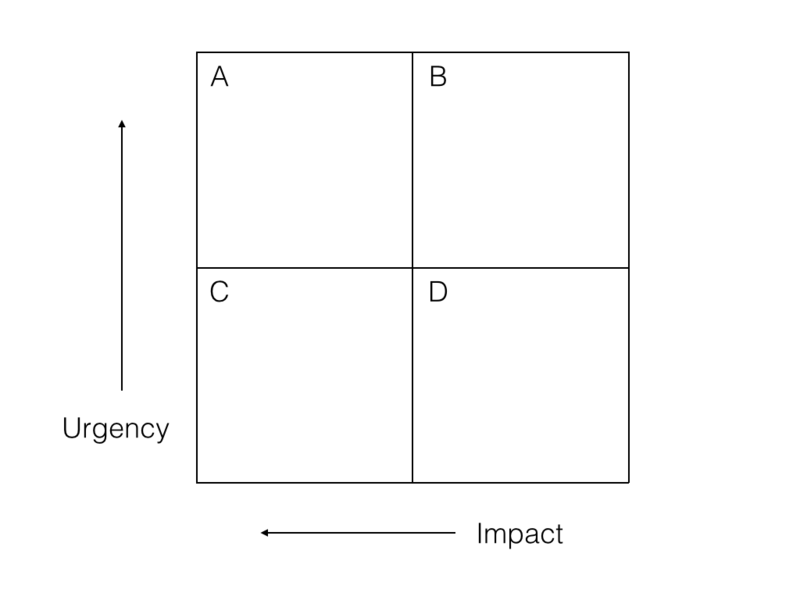 The Value Quadrants tool breaks tasks down into two distinct kinds of importance. You consider them separately, then combine them in a way that makes their relative value more clear. Impact is one kind of importance. Something is impactful if it makes a big difference. If there is little or no consequence if a task doesn’t get done, ever, then it is a low-impact task. Impact is completely separate from time sensitivity. Filing taxes is high-impact, because if you don’t file them, you’ll have serious consequences. Sending out holiday cards to thank your clients is a nice thing to do, but it is relatively less impactful — you aren’t likely to lose money if you skip it. Urgency is the second kind of importance. Urgency has strictly to do with time sensitivity, and nothing else. If a task must get done today or else you may as well not do it, then it is urgent. If there is no benefit to doing a task sooner than later, or if it can be done much later without consequence, then it is not urgent. In early December, sending out holiday cards to your clients is urgent, because it won’t look good for you to send them after the holidays. Filing your annual taxes is not urgent — not until the deadline looms. If you get them done sooner, there is little if any benefit. Now we can say that something is important because it is impactful, or because it is urgent, or both. Of course, a task may also be neither urgent nor impactful. With these separate qualities defined for each task, now we combine them to identify the task’s value. You can visualize the relative value of tasks by plotting them on a grid into four quadrants. 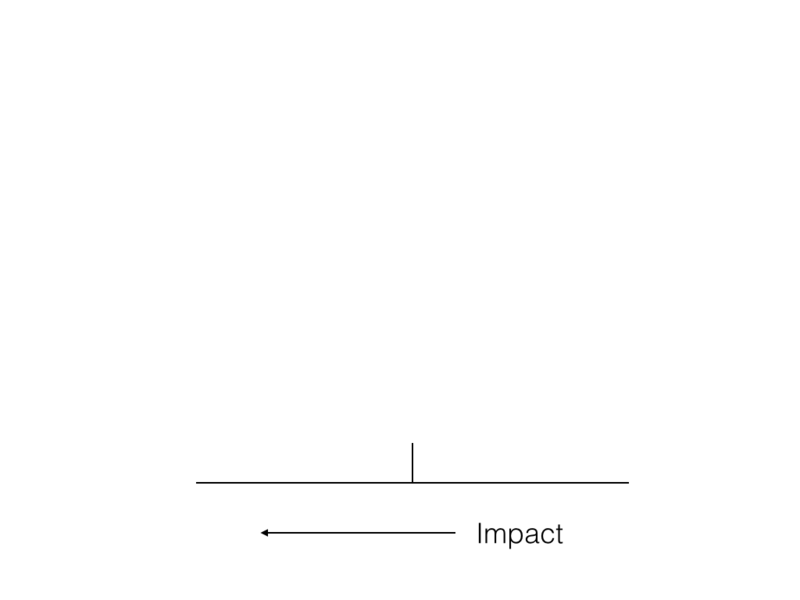 Start by drawing a horizontal line, and label it “Impact” underneath, with an arrow pointing from left to right. Divide the line in half with a little vertical line. You’ll plot more impactful task on the the left side of this line. Now add a vertical line to the diagram, intersecting the left side of the Impact axis at a 90 degree angle. On the left side, label it “Urgency”, and draw an arrow pointing from the bottom to the top. Divide this line in half with a little horizontal line. You guessed it: You’ll plot more urgent tasks in the top half, less urgent tasks in the bottom half. 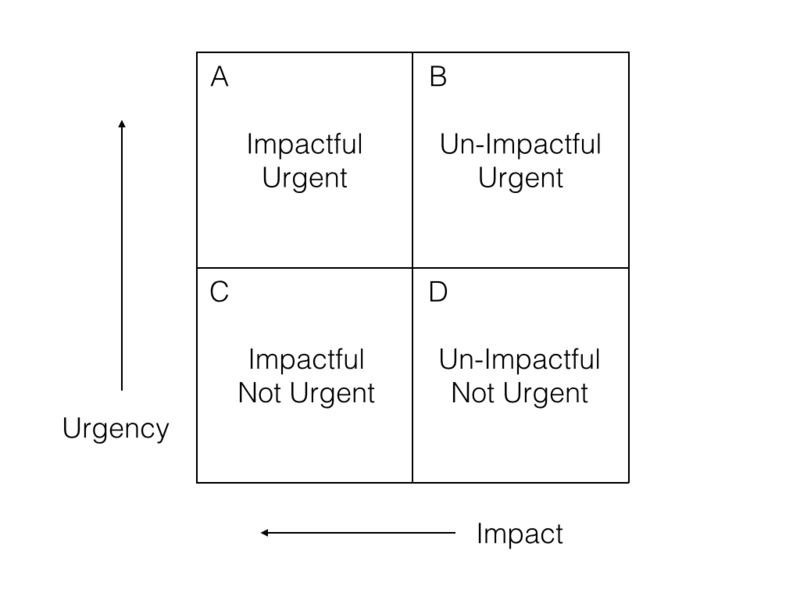 Step One: For each task, identify whether or not it is urgent, and whether or not it is impactful. Step Two: Score each task using the Value Quadrants. Each task is an A, B, C, or a D.
Step Three: Look at just the tasks in the “A” quadrant first. Set tasks in all other quadrants aside for now. Theses are your High Value tasks, both urgent and impactful. Nothing else on your todo list matters as much as your “A” tasks, so put everything else out of your mind! Decide on an order to tackle your A tasks. Step Four: Get to work! Prioritize your A tasks. When they’re complete, move on to your B tasks. Your B task are the next most valuable to be working on. Sort your B tasks just like you did with your A tasks, and get started. And so on. Do you still have too many High-Urgency, High-Impact tasks? Going through steps 1 through 3 and still ending up with more A tasks than you know what to do with can be demoralizing, so I find it helps to sort them further into sub-groups. 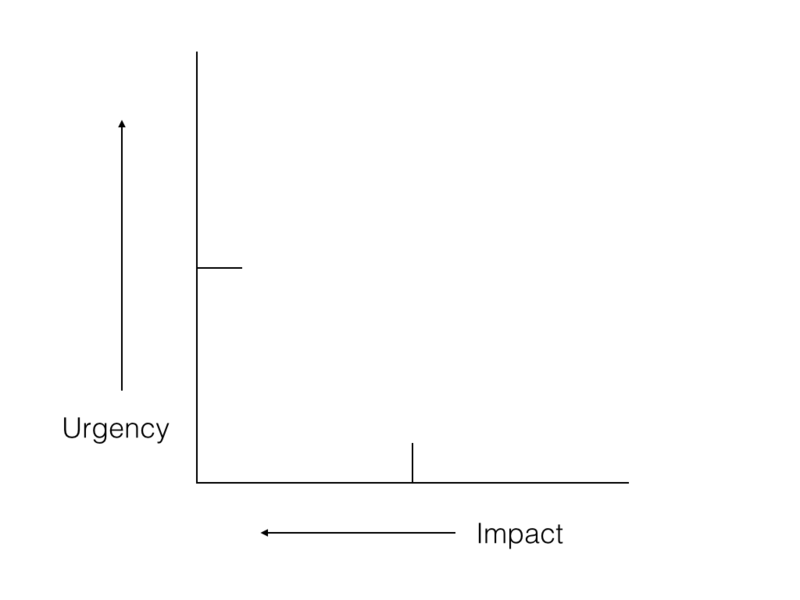 Try considering other ways of measuring importance besides Urgency and Impact. Perhaps some of your A todos are worth a higher dollar value, so you may choose to prioritize them above others. Some tasks are harder to complete than others, or take more time. I usually try to tackle the harder or longer ones first, to get them out of the way. If you’re the kind of person who can use some early victories to boost your morale and build up steam, you might get some easier ones crossed off the list first. It’s great when you finally get to your C quadrant tasks, because you’re working on impactful things without the pressure of working under the clock. When you get to D quadrant tasks, congratulate yourself on having the discipline to do everything that was more important first. You can attend to these remaining chores with a calm, peaceful state of mind. Draw the diagram. Don’t just imagine it — actually draw it! Put it on the white board near your desk, or draw it habitually in the corner of your scratch sheet of note paper. Keeping even this empty grid in sight as a visual aid helps instill the habit of thought about what’s most impactful, and what’s the most urgent. Score tasks on the diagram. Again, don’t just imagine it. With the visual representation of the most important tasks grouped together, I find it easier to put everything else out of mind. Experiment with spreadsheets. For a while, I set up a spreadsheet that took “low” or “high” urgency and impact input for each task and automatically calculated and sorted tasks into their quadrants. That sped up the routine process of scoring and then sorting tasks. Try a larger grid. When I have an extra large heaping pile of todos, I score them on a 3 by 3 grid, with a a “Low, medium, or high” scale for urgency and importance. It takes a little longer, but I you’ll get a more manageable list of the most important things to do first. I hope there’s something useful for you here. Perhaps just this mindset alone will help you make better decisions about how to spend your time. Let me know if there’s value for you in Value Quadrants (heh). I have some more follow-up thoughts drafted to go deeper into the this tool, that I’ll spend some time polishing if people are interested. So, I’d especially love to hear if you’re interested in more of this kind of thing from me. True Fact: The comment box down below a little ways is useful for these things. Get an update when I publish the follow-up! Video from my talk at WordCamp Portland is now live on WordPress.tv! The title of the talk is “Checklists: A Path to Mistake-Free Development and Publishing”. But, as my friend Justin tweeted, it wasn’t really about checklists, so much as about keeping your promises. In lieu of posting slides (the slides were too interactive and aren’t valuable on their own), I’ll follow this up soon by posting a digest from the talk. Check out the video, and if you enjoy it, please pass it on and let me know what you think!